Watch Fight Night: Dos Anjos vs Alvarez on July 7 - Subscribe to UFC FIGHT PASS now! The Ironman. 24 Hours of Le Mans. Law and Order: SVU Marathon. Well add one more grueling endurance event to the list – UFC International Fight Week. That’s right boys and girls, it’s time for another three straight UFC events (and Downes Sides). IFW kicks off July 7th at the MGM Grand Garden Arena in Las Vegas, Nevada with UFC Fight Night. In the main event of the evening, Rafael dos Anjos defends his belt against Eddie Alvarez. In the co-main event, Derrick Lewis makes a jump up in competition as he takes on the veteran Roy Nelson. We’ll start in the lightweight division with John Makdessi and Mehdi Baghdad. 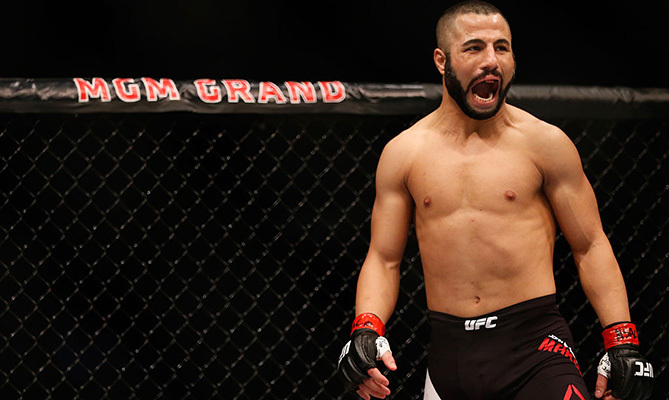 A powerful striker with a Tae Kwon Do background, Makdessi tries to find some momentum after two straight losses to Yancy Medeiros and Donald Cerrone. A Muay Thai champion, Baghdad lost his UFC debut to Chris Wade back in January. He took that fight on nine days’ notice, so he’ll try to prove that that performance was an aberration. Even if you throw out his debut, Baghdad still has defensive grappling holes. Makdessi has never completed a takedown inside the Octagon, so chances are this will be a standup affair. Baghdad has a traditional Thai style that I would call “tanking.” He doesn’t slip much or dodge attacks. Instead, he prefers to stand strong and keep a tight guard. He throws for power rather than volume, and inside elbows are his favored technique. Makdessi struggles against opponents with significant reach advantages, but Baghdad’s style almost invites people to come in tight. As the shorter fighter, Makdessi will also have a natural defense from the horizontal elbows. “The Bull” crowds Baghdad, unleashes a few uppercuts and returns to the win column with a second-round TKO. We remain in the lightweight division for Joe Duffy and Mitch Clarke. 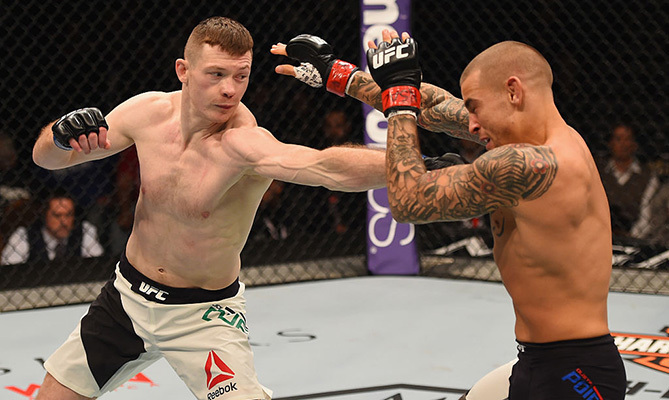 “Irish” Joe started his UFC stint with two straight wins, but a battle with Dustin Poirier found him on the wrong side of the judges’ scorecards. A smooth striker with a wealth of boxing experience, nine of his career wins have come via submission. “Danger Zone” Clarke is also looking to right the ship after losing his last fight to Michael Chiesa. Both fighters have tremendous submission skills, but they lack offensive wrestling. Clarke’s takedowns come more from scrambles than purposeful attempts. Duffy converts slightly better than half his takedowns, but again, they’re more reactive shots than planned. Much like the Makdessi/Baghdad fight, I expect this to be another standup affair. Duffy keeps his hands at his waist, and Poirier made him pay for it. That was because Duffy could not adapt to Poirier’s hand speed. Clarke does not present that challenge. Even if Duffy hasn’t found an answer to defending counter right hands, Clarke’s relatively low accuracy (34.16%) should work to Duffy’s advantage. Duffy hurts Clarke with an overhand right in the second, a stunned Clarke pulls guard to weather the storm and “Irish” Joe eventually works in a rear naked choke. Next we jump up to heavyweight for Roy Nelson and Derrick Lewis. Everyone’s favorite portly power puncher, Nelson outworked Jared Rosholt to a decision win his last time out. He even showed a new level of tactical awareness. Sometimes you can teach 40-year-old fighters new tricks. Once considered an average heavyweight by fans at large, Derrick Lewis’ three straight KO wins have some believing that “The Black Beast” could be a force in the division. We all know the Roy Nelson playbook – WATCH OUT FOR THE RIGHT HAND! Some analysts like to talk up his BJJ prowess (which he certainly has), but he hasn’t displayed that in a cage since Panic! At the Disco had a hit song (you know which one). That being said, avoiding the right hand is a lot easier said than done. For all of Lewis’s physical prowess, he can be reckless at times. He charges in hard and leaves himself open to counter shots. Nelson isn’t the only one prone to defensive lapses, though. He overcommits on the right hand and often throws it so hard he falls out of his stance. Lewis needs to keep this in the center of the Octagon. Gabriel Gonzaga was able to hold him against the fence and his only defense was to stall until the ref broke it up. 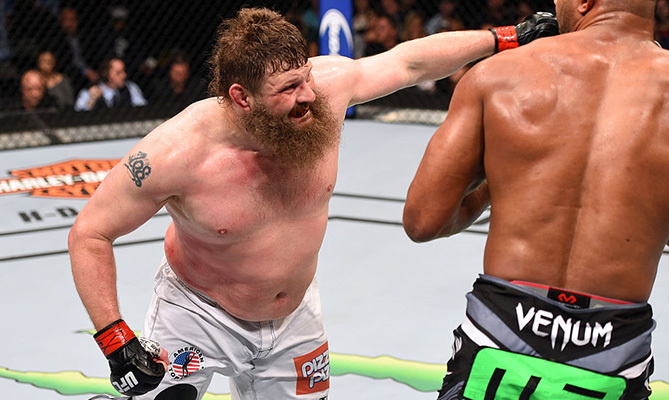 This fight feels like a toss-up, but Roy Nelson has enough tread on the tires to pull off a first-round TKO. Time for the main event! Winner of five fights in a row over names like Anthony Pettis, Donald Cerrone and Nate Diaz, Rafael dos Anjos looks like he could be on top of the talent-rich 155-pound division for a long time. A former champion in his own right, Eddie Alvarez plans on adding another belt to his collection. RDA has gone from a grinder to a striking powerhouse. His straight left hand and left leg have brought the best in the division down. He stalks his opponents into a corner and then unleashes rear hand/leg strikes with bad intentions. This low volume/high force philosophy has brought him great success, but it does have weaknesses. Specifically, even though he does throw his cross efficiently, he does leave himself open to counter right hands. His heavy stance also leaves him susceptible to a well-timed takedown (think Donald Cerrone vs. Patrick Cote from a couple weeks ago). Alvarez needs to be the aggressor. If he lets RDA back him down, it could be a short night for him. He needs to fight dos Anjos the same way he fought Pettis. The only problem is that RDA won’t allow himself to be stalled against the fence. Dos Anjos defends the clinch and strikes his way to the unanimous decision. That wraps up another premiere edition of the Downes Side. Follow me on Twitter @dannyboydownes. Also don’t forget to leave your own propositions, prepositions and prognostications on the page here.